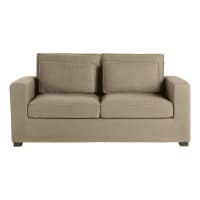 The elegant, understated MILANO 3 seater standard sofa in taupe fits into any interior style. This low-maintenance cotton sofa has a fully removable pure cotton cover. This square taupe sofa provides a comfortable seat supported by 2 additional back cushions. This modern sofa comes in 4 different shapes and a total of 10 collars to suit your style and space. Frame: Solid pine, particle board and fibreboard.